William Morrow Paperbacks, 9780062369475, 416pp. 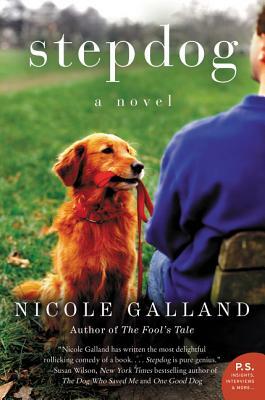 From the author of The Fool’s Tale and I, Iago comes a disarmingly charming and warm-hearted “romcom” about a woman, her dog, and the man who has to prove that he is good enough for both of them. Sara Renault fired Rory O’Connor from his part-time job at a Boston art museum, and in response, Rory—an Irish actor secretly nursing a crush on his beautiful boss—threw caution to the wind, leaned over, and kissed her. Now Sara and Rory are madly in love. When Rory’s visa runs out on the cusp of his big Hollywood break, Sara insists that he marry her to get a green card. In a matter of weeks they’ve gone from being friendly work colleagues to a live-in couple, and it’s all grand . . . except for Sara’s dog, Cody, who had been a gift from Sara’s sociopath ex-boyfriend. Sara’s over-attachment to her dog is the only thing she and Rory fight about. When Rory scores both his green card and the lead role in an upcoming TV pilot, he and Sara (and Cody) prepare to move to Los Angeles. But just before their departure, Cody is kidnapped by Sara’s ex—and it is entirely Rory’s fault. Sara is furious and broken-hearted. Desperate to get back into Sara’s good graces, Rory takes off and tracks Cody and the dog-napper to North Carolina. Can Rory rescue Cody and convince Sara that they belong together—with Cody—as a family? First they’ll need to survive a madcap adventure that takes them all across the heartland of America. Stepdog is a refreshing and hilarious romantic comedy that asks: How far would you go for the one you love? — Peter Sagal, Host, NPR's Wait Wait...Don't Tell Me!